Print an Old Navy coupon good for $5 off any $25 purchase. This coupon is valid through May 24, 2012. 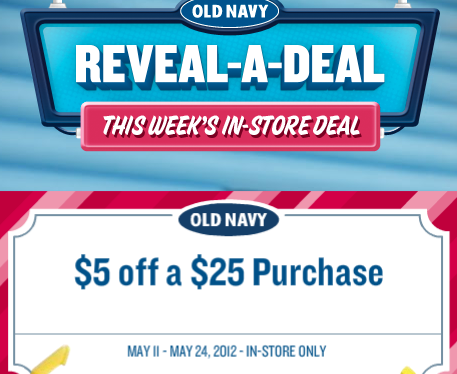 And don’t forget to download the free Old Navy app to get free Old Navy flip flops and more! Yay! To wish you a Happy Mother’s Day, Shutterfly and The Ellen Degeneres Show have come together to offer a FREE 8×8 20 page Hardcover Photo Book (a $29.99 value)! All you have to pay is around $8 for shipping, which is an awesome price for a personalized gift delivered to your door! * Offer good for one free 20-page 8×8 photo book with hard photo cover. Offer not valid for licensed premium photo books, leather hard cover, padded photo cover, cloth hard cover or soft photo cover photo books. Offer valid on one order and for one-time redemption per billing address. Any additional pages will incur a per-page fee. Offer ends Monday, May 29, 2012 or while supplies last. Here’s a long list of freebies that have been available recently that should still be available. In addition to the free 8×10 Photo Enlargement code I posted earlier, there’s another coupon code available so that you can pick up an additional free 8×10 Photo Enlargement. Get a free 8×10 Photo Enlargement at Walgreens when you use coupon code FREE4ME2 at checkout. Choose to pick up the photo in-store and shipping will be free, too. This offer is good through May 12, 2012. Starting tomorrow, May 11th and going through Sunday, May 13th, Babies “R” Us is having an in-store only weekend sale in which you can take an EXTRA 50% off already reduced clearance prices on clothing and shoes – no coupon needed! This would be a great time to stock up on clothing for the kiddos, as prices will be up to 85% off! Wow! *In-store only. Quantities limited; no rain checks. Final discount taken off original price. Clearance Pricing ends in 0 or 8. Excludes Dollar Shop items, and Converse, Nike, Pediped, Puma, Robeez and Skechers footwear. Clothing and shoes not available at all Toys”R”Us stores. Offer valid 5/11-5/13. Hurry on over here to snag a FREE one year subscription to O, The Oprah Magazine ($47.40 Value!) courtesy of American Family. Note that after filling out your info, you may be taken to various offer pages. On these pages, you’ll have the option to click “Skip” to skip the offers (just like the pic below). You’ll want to act fast, as this offer is limited to the first 8,000. * Please note that this offer is only available to new members of American Family. 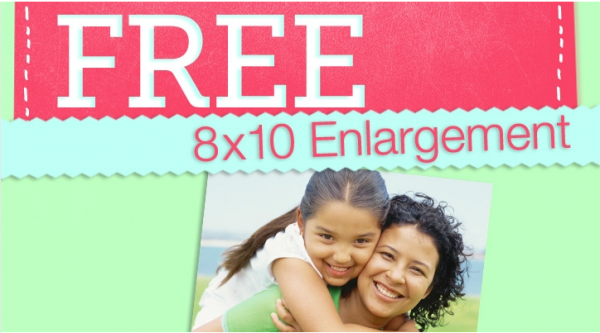 Get a free 8×10 Photo Enlargement at Walgreens when you use coupon code FREE4ME at checkout. Choose to pick up the photo in-store and shipping will be free, too. Tomorrow, May 5th, from 1PM – 5PM, head on over to your local Bath & Body Works to snag a FREE Wild Garden Tote and Full Size Malibu Heat Body Lotion (valued at $16) with any full size Signature Collection purchase! Even sweeter, select stores will have a Spin and Win game where you’ll have a chance to win even more prizes! Don’t want to leave your house? You’ll be able to snag the same deal online all day long! Note that shipping is only $1 when you spend $25 with the code SHIP25 at checkout. Plus, be sure to go through ShopatHome.com for an additional 3.5% cash back! Fine Print: Limit one free Wild Garden event bag and full-size Malibu Heat body lotion per customer. Offer excludes home fragrance, accessories and gift sets. While supplies last. To redeem online, add any full-size Signature Collection Body Care product to your shopping bag and enter promotion code at checkout; the free gift will automatically be added to qualifying orders. This promotion code can only be redeemed for the free Wild Garden bag, free full-size Malibu Heat body lotion and $1 shipping on orders of $25 or more; it is not valid with any other offer that requires you to enter another promotional code at checkout. If another code is entered at checkout, these offers will be void. Offer valid only at U.S. Bath & Body Works stores 1 p.m. – 5 p.m. May 5, 2012 and at BathandBodyWorks.com through 11:59 p.m. EST May 5, 2012. Not valid at Bath & Body Works stores in Canada and Bath & Body Works Outlet locations. Head on over to Ace Hardware’s Facebook page, “like” them, click on the “Find Your Soul Paint” tab, and finally click on the “like” button inside the little square that says, “Free Paint Saturday.” After clicking this button, you’ll be able to print a coupon good for 1 FREE Quart of Clark + Kensington Paint+Primer In One, valid May 5th only. Then take your coupon to Ace Hardware tomorrow morning, May 5th, to get your free paint! This freebie will likely run out quickly, so you may want to stop by first thing in the morning. FREE Carseat Canopy For Baby Carseat! Baby Carseat Cover – Protect and cover your little one! 2. Click on “Shop Now” and select any carseat canopy you like. 3. Once you have made your selection, you’ll automatically be directed to the shopping bag. - all you pay is the shipping fees which are $12.95. This promo code is also good for $50 off the cost of any of their 5-Piece Whole Caboodle Sets! Remember: the promo code is ” CCMOTHER ” and you can use it more than once – just open a new browser window each time you do.